Château Pavie is the largest St.Emilion 1er Grand Cru Classé, with over 35 hectares of vineyards located exclusively on the St-Emilion Côtes. 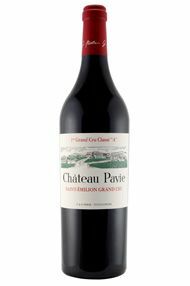 Pavie is situated south-east of the village of St-Emilion and its vineyards lie on a south-facing slope of the famous limestone plateau. Pavie's vineyards are bordered by those of Château La Gaffelière and Château Pavie-Decesse. For many years the property was owned and run by Jean-Paul Valette. In 1998 Gérard Perse, who also owns Pavie-Decesse and Monbousquet, purchased it. 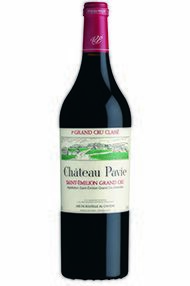 Pavie's wine is typically a blend of 55% Merlot, 25% Cabernet Franc and 20% Cabernet Sauvignon. Since 1998, the grapes have been fermented in spanking new wooden vats with the wine then being aged in 100% new oak bariques for 18 months. It is bottled unfiltered. Pavie produces elegant, harmonious and stylish St-Emilions that typically display a fine bouquet with good depth of fruit on the palate. Under the Perse regime Pavie has become richer, more intense and more concentrated. Ch. Pavie occupies some of the best terroir in all of Bordeaux. The vineyards sweep up the steep slope and onto the plateau that rises high to the right of you as you enter St Emilion town from the southern plain. 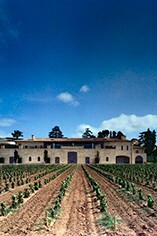 Bought in 1998 by Gérard Perse, he gave the property as high a level of attention and passion as he did to amassing a fortune from supermarkets. The wines entered a controversial period when, under the guidance of Michel Rolland, yields were slashed and the wines became super concentrated and super intense. This achieved 100-point scores from Robert Parker and the coveted “Premier Grand Cru Classé (A)” grade, but at the possible expense of the property’s magnificent terroir. The 2016 vintage has seen a marked shift back to making a wine that is less extracted and which will be aged in less punishingly new oak. The proportion of Merlot has been reduced and the Cabernet Franc and Cabernet Sauvignon raised. The 2016 itself is inky deep in colour and slow to come through on the palate, although the expressions eventually work their way through, revealing plum fruits, enticing notes of spice and gentle hints of leather. The close is dense and tannic, yet the fruit persists and is accessible; promising a wine that is altogether more amenable to some of the supercharged wines of Perse’s earlier years. It will be drinking that bit sooner and it undoubtedly gives more of the vineyard itself. Drink 2024-2040. What a dark and intense nose. At first, layers and layers of blackberries abound with purple juicy plum, with cherry, and some macerated cherry. This flows into eucalyptus, liquorice and a touch of menthol with a little chocolate and vanilla. On the palate the same concentration and abundance of flavour comes through. Tannins are bite-y so we would recommend this as one for laying down. What fun, excitement and joy it will be to compare the four perfect wines Perse has made in 2005, 2009, 2010 and, of course, the 2000, in 25 or so years. This wine is truly profound Bordeaux. Everything is in place remarkable concentration and a beautiful nose of cedar and ripe blackcurrant and blackberry with some kirsch and spice box in the background. Lavishly rich, with slightly more structure and delineation than the more Rabelaisian 2009, this wine does show some serious tannins in the finish, and comes across as incredibly youthful. Of course, it's five years old, but it tastes more like a just-bottled barrel sample than a 2010. In any event, this wine is set for a long, long life and should be forgotten for at least another decade. Consume it over the following 75 or more years.